Pink flowers range in color from palest champagne and baby pink to nearly neon magenta. They can evoke the electricity of romance or the serenity of dawn. Many, like the deep pink 'Fame' hybrid rose, create a striking contrast against green foliage. Others, like the species redleaf rose (Rosa rubrifolia), have pink blooms with complementary purple or pink-hued leaves. 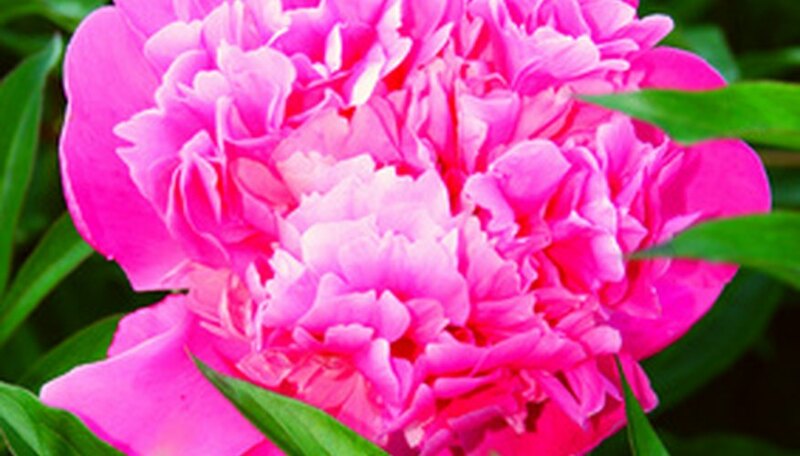 Pink flowers of all kinds are attention-grabbing garden additions. ‘Erica,’ a perennial astilbe (Astilbe) cultivar, lights shady, early summer gardens with its graceful, tall spikes of pale, heather- pink blooms. The feathery flowers, on up-to-3-foot stems, arch above an airy mound of lobed, deep green summer foliage. They last for as long as 10 days before giving way to attractive green seed heads. Each plant can grow up to 2 feet wide, making an impressive garden display. Like all astilbes, 'Erica' needs partial to full shade and consistently moist soil, according to the Missouri Botanical Garden. It handles winter temperatures as low as minus 30 degrees Fahrenheit (USDA Hardiness Zone 4). Growing up to 15 feet high, butterfly bush (Buddleja davidii) ‘Pink Delight’ dazzles passers-by with a full summer of fragrant, deep pink flower clusters. As long as 15 inches, the blooming spires contrast appealingly with the shrub's grayish-green leaves. Removing the dead blossoms can extend flowering until frost, according to the Missouri Botanical Garden. Irresistible to butterflies, 'Pink Delight' provides lovely cut flowers. Blooming most profusely in full sun and moist, well-drained soil, it makes the greatest impact planted in groups. Garden phlox (Phlox paniculata) is an old-fashioned summer favorite. The ‘Eden’s Glow’ garden phlox cultivar has pyramidal clusters of July-to-September blooms. Eye-catching against its deep green foliage, the sweetly fragrant, orchid pink flowers attract hummingbirds and butterflies. They also make showy additions to floral designs. The 24-to-30-inch plant likes a fertile locations in full sun. It benefits from good air circulation, according to the Missouri Botanical Garden. As vibrant as its name, the ‘Pink Hawaiian Coral’ peony (Paeonia) cultivar is a 3-foot high and wide, green-leaved spring bloomer. Hardy to minus 40 degrees Fahrenheit, it has large, yellow-centered, coral pink flowers. Blooming in May or June, 'Pink Hawaiian Coral’s' double blossoms shine for up to 10 days in perennial borders or along walls and walkways where passing traffic can enjoy their display. Its foliage remains attractive through the summer, making a good backdrop for other blooming plants. This peony likes full sun to partial shade and fertile, moist soil, according to the Missouri Botanical Garden.